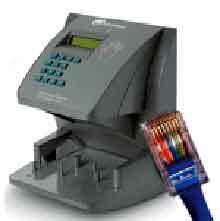 Hand Punch model HP3000e for networks. 512 employees, upgrades to 36,000. Schools, factories, banks, large offices, this does it all. 9" wide. 12" high, 8.75" deep, 6 lbs installed.